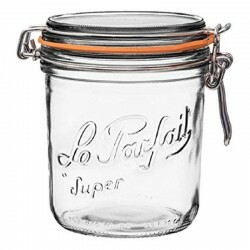 Le Parfait Super Terrine jars offer clean, French design. The jars feature the easy-to-use construction of a hinged, wire bail lid, and the terrine has straight sides that taper slightly at the bottom. The jar beautifully displays the contents inside, and the large mouth allows for easy filling. The wide lid and smaller footprint allow easy stacking for storage. The Super Terrine has been sought after by cooks, collectors and restaurateurs for the simple elegance it brings to both preserved food and as a storage container. This is the classic, French kitchen workhorse. The wire bail with high quality orange rubber seal keeps the contents air tight, which means a long-term shelf life. For general storing, it opens easily and closes tightly, keeping contents secure. The Super Terrine’s shape and sizes are good for pates, layered terrines and potted desserts. As well, the terrine can be used like a standard canning jar for soups or sauces, pickled vegetables, olives, salsas, baby food, seeds and nuts, spice and salt mixes, compound butters, ground or whole bean coffee. The straight sides make the jar suitable for freezing, providing at least 3 cm headspace is left at the top to allow for food expansion. Super Terrine jars can be used for water bath and pressure canning. The 350ml terrine jar requires a 85mm seal. 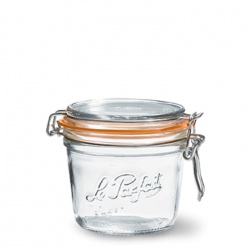 Le Parfait Super Terrine jars are available in 7 different sizes so you can be sure to find a jar for every preserving application!